the ever changing landscape of Liverpool from over 400 feet in the sky! Radio City Tower is a radio and observation tower in Liverpool, England, built in 1969 and opened by Queen Elizabeth II. It was designed by James A. Roberts Associates in Birmingham. 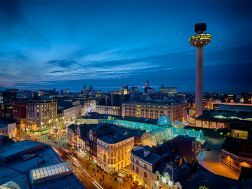 It is 138 metres tall, and is the second tallest free-standing building in Liverpool and the 32nd tallest in the United Kingdom.